Apparently in June the number of JAFF releases decreased in comparison to the previous month, but still, we had some very interesting new releases, and one of them was Chaos Comes to Longbourn from Victoria Kincaid. Today she is visiting From Pemberley to Milton to talk a little about the writing of this story, to share with you an excerpt, and offer a copy of Chaos Comes to Longbourn to one lucky winner. Chaos Comes to Longbourn is a bit of a departure for me. Of course every book an author writes is a new adventure and presents different issues, but this one offered some very particular challenges. It is only the second of my Pride and Prejudice variations that I would consider to be an out-and-out comedy. All of my books have humor and funny moments, but this is only the second one (after Mr. Darcy to the Rescue) where I set out with laughter as a consistent goal. In addition, it is the first P&P I’ve written with multiple points of view. My previous books have focused on two main characters, the people falling in love—who are usually Darcy and Elizabeth (although When Mary Met the Colonel focused on Mary Bennet and Colonel Fitzwilliam). Usually we see events unfolding only through these characters’ alternating viewpoints. But the point of Chaos Comes to Longbourn was to have everyone engaged to the wrong person. I needed to get inside the heads of other characters to observe their reactions to their various betrotheds. I was more than halfway through the first draft when I realized I was writing from eight different points of view! On the one hand it was great fun. In the original P&P, we never have a chance to see Charlotte encounter Wickham or hear Darcy’s thoughts about Lydia. So it was endlessly amusing to imagine how those characters would react to each other (especially when they are engaged to each other). On the other hand, it was very challenging to keep eight different perspectives and storylines going at the same time—and intertwining them effectively. I’d never done it before, so I didn’t realize how difficult it would be. I was forever looking back to make sure the story made sense. Did Elizabeth learn about X before or after she met Darcy on the road? Should Wickham talk to Lydia after his conversation with Charlotte or after seeing Darcy? When I sent a draft to my betas I begged them to check for errors in continuity, fearing a character knew something or said something when the chronology didn’t make sense. But writing Chaos Comes to Longbourn was a great learning experience and I would do something like it again in a heartbeat—if the right plot bunny came along that necessitated multiple POVs. I learned so much more about the various characters of P&P—beyond Darcy and Elizabeth— by entering their heads and imagining how they would think and act. It reminded once more how brilliant Austen is. Just when I thought I knew all about the novel, it surprised me again! “Is your estate very grand?” Lydia interrupted. Darcy blinked at the rapid shifts in conversation. “My family house is Pemberley…” he temporized. Did she wish him to brag about his possessions? He found the thought distasteful. “Then I shall live there most of the year, and I will not need to go all the way to Peckerly!” she declared triumphantly. “If you wish.” Darcy silently resigned himself to years of avoiding London. Lydia froze, suddenly wary. “I am sure I do not know what you mean,” she sniffed. “There was no man.” Lydia’s voice quavered as she stared straight ahead, refusing to meet Darcy’s eyes. Darcy scrubbed his hands over his face. Lydia was correct about the scandal, unless Darcy found the other man and persuaded him to marry her. If she jilted Darcy, it would be a minor contretemps, but if he did not keep his word, the Darcy name would suffer. He prayed that the other man was not already married—and that he would be susceptible to monetary inducement if necessary. Victoria Kincaid would like to offer one copy of Chaos Comes to Longbourn to one lucky reader who will be able to choose either a paperback or an e-book copy. The giveaway is international and to participate all you have to do is comment this post. Let us know what you think of the blurb or the excerpt and share your love for JAFF with us. The giveaway is open until the 14th of July and the lucky winners will be randomly picked and announced a few days later. I must read this story. What a laugh! La! If I am not so lucky as to win this will soon be in my possession. Sounds delightfully funny. Thanks for the excerpt. Hi Sheila, Thank you for your interest. La! And good luck. Hi Denise, I’m glad you enjoyed the excerpt. Good luck with the giveaway! Oh, boy! I feel bad for Darcy in that excerpt… it’s like talking to a child! I love the premise of this story and can’t imagine how you were able to keep everything straight with all the various engagements and subplots but looking forward to some humor and where all the characters end up with their intended! Hi Dung, I felt bad for Darcy too, but I do enjoy torturing him — particularly when it’s funny. Good luck with the giveaway! Everything is all jumbled up! Lydia has always made me want to bang my head against the wall, but if she actually married Darcy, she would… I can’t even think about the horror. I am looking forward to reading it, and seeing how everything ends up just how it is supposed to be. Yes, it is a horrible prospect. Everything does end happily, I promise. Good luck with the giveaway! Victoria,I have no idea how you thought up this torturous notion!!! All our beloved (and some not so beloved) characters set up walk down the aisle with a partner that is the polar opposite of the one they would choose for themselves!!! I can’t wait to find out how they sleepwalked into this situation and can just imagine the nightmares you endured when trying to weave a more appropriate marital path for each of them,that would lead them to domestic felicity!!! Can’t wait to read it!! My thanks to Rita and Vivtoria fur the chance to win this book. Hi Mary, I had fun thinking up the most unlikely pairings. But then I had to figure out a way to undo them. That was a challenge! Good luck! I absolutely loved this. Victoria, you nailed Lydia. I love how she calls Pemberly “Pembleton” and than “Peckerly,” and of course Lydia try to move a whole estate a county or two while your at it. I’ve got a feeling I won’t be able to read this out in public with embarrassing myself with laughing. Hi Amanda, It’s fun writing Lydia because you can’t be too over the top. I’m glad you liked it. Good luck with the giveaway! Hi Vesper, Me too, although I do like torturing him. 🙂 Good luck! What a fabulous plot…poor Darcy but how much he will appreciate Eluzabeth. Of course he can’t be left with Lydia since that is even worse than Caroline! Hi Theresa, It does make him appreciate Elizabeth! Thank you for your interest and good luck! I’m glad you liked the excerpt. I love comedy and romance too. Good luck with the giveaway! I think out and out romcom’s are great reads between the more dramatic ones (like a palette cleanser). Eight points of views, whew! But it sounds exciting and fun to get into the larger cast of character’s heads. Looking forward to it. Hi Sophia, Yes, somehow I’ve fallen into a pattern of writing a comedy then a drama and then a comedy. It’s not deliberate; it’s just the way the ideas come to me. Thank you for your support! Wonderful excerpt. Such an incredible mess! Poor Darcy. Just a conversation with Lydia……and all the other mismatched couples! I am very curious to see how this says out! Congratulations and thank you for the giveaway. Hi Becky, I’m glad you liked the “mess”! Good luck with the giveaway! Hi Priscilla, Thanks for your interest and good luck! Great excerpt! Poor Darcy tied to the silliest of the younger Bennet girls. I can’t wait to read more! Thanks for sharing that scene and for the giveaway. Hi Kim, Yes, it’s definitely a mismatch! Good luck with the giveaway! Oh good Lord what a mix up! And what is Darcy thinking of? Surely if he tells Lydia that if she marries him she will have to live at Pemberley all the time with no balls no visitors and no London! I’m sure she would soon admit she was with Wickham! I so look forward to reading the rest of this book and seeing how it is all sorted so Darcy and Elizabeth get together. Hi Glynis, I just don’t think he could stomach the thought of Lydia at Pemberley. 🙂 Thank you for your interest and good luck! When Sophia mentioned RomCom I immediately pictured this book as a movie! Can you imagine the hilarity of watching it all happen before your eyes! Yes, Darcy, how come you can’t move Peckerly closer?!!! So looking forward to this book! Thank you for the generous giveaway! Hi Carole, It would make a funny movie. Maybe I should write a screenplay version. 🙂 Thanks for your interest and good luck! Oh my Lydia, becoming Mrs Darcy… That promises to be an interesting storyline!! Would love the chance to read it. Thanks for your interest and good luck with the giveaway! Oh boy…Darcy and Lydia? That should be a disaster… I can only imagine the rest of the mess and how funny it all must be…! It definitely is a disaster in the making! Good luck with the giveaway! I can’t really say which of your books is the best, but Chaos is certainly the most humorous. What a reading treat it is. Thank you..
Darcy and Lydia? Chaos indeed! What a crazy situation for them to be in. The Darcy / Lydia combo is frightening, but it looks like you have imagined their interactions perfectly. I can tell this is going to be a fun read! 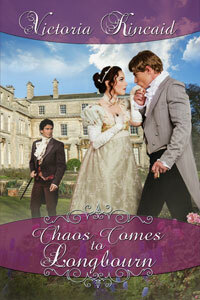 I can imagine that Darcy is quite terrified, not knowing the book will have HEA! Not only would they “not suit”, a marriage to her would be way worse than any marriage of convenience. This sounds like a mystery wrapped up inside a comedy. Looking forward to reading this book. Thanks for the giveaway. OMG!!! Count me in this sounds wonderful. Can’t wait to read Chaos Comes to Longborn! I can imagine the panic Darcy feels at the idea of marrying Lydia…and she’s so clueless. It should be a very entertaining read, as are all the Victoria Kincaid books I’ve read. I’m so addicted to JAFF novels. “Peckerly?” Hahahaha! This sounds like a hoot! What a story. Lydia is so feather brained. I wonder how you set all these crazy pairing to rights. Thank you for the generous give away. I have to know how you disentangled all these unbelievable pairings… I hope I get lucky or get a ton of work this month! This book sounds SO good, I’d love to read it!